Saturday was just beautiful; sunny and warm if a little windy. 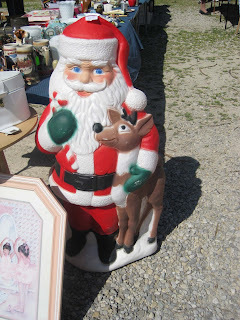 Mom and I had been anxiously anticipating the first flea market in Evansville that we discovered last year. So, we got up super early Saturday morning and headed west. Tim decided to stay home and sleep! 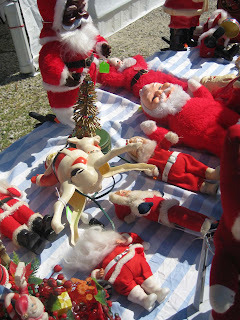 The flea market was great! Lots of goodies to be found! Some super deals, some reasonable prices and some way overpriced items! The first booth I went to had boxes of books for 25 cents each! I got another 8 old encylopedias with beautiful pictures and color plates! An adorable baby book that mom took home with her, Ideals magazines, books to dissect for ephemera packs, etc! I also got some neat old 60s/70s Christmas ornaments! Other treasures of the day included an unopened box of coupon books (90 total! ), a Lotto game, old 1940s magazines, an Easter Candy box for my collection, a stack of travel souvenir plates, a stack of paper doll dresses, neat old magnets from the 70s, a box of pink and white buttons, Dennison leaf seals, a little toy register for $1, giant greeting cards with adorable children on them, stationery, animal anagrams (I'm keeping! ), a neat package of rhinestones, vintage Easter egg dye (a pack I actually didn't have! 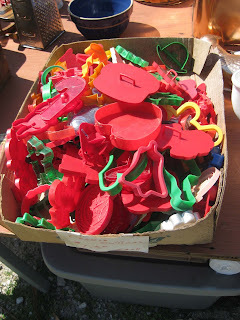 ), washer and dryer S&P shakers, a souvenir ashtray, two 1960s yearbooks and the most incredible die cut scrap I paid dearly for! 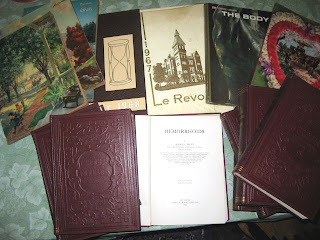 The best find had to be the 1930s medical book on Hemorrhoids from a Dr's estate! The perfect Etsy find! Mom was thrilled to find a mannequin torso and two "heads" for displaying vintage clothes and hats! She also found some vintage postcards, books and apparently some secret gifts for yours truly! 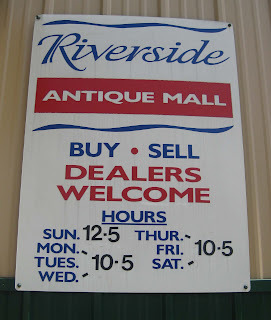 We stayed there for 5 hrs and then went to the Riverside Antique Mall. Mom found a gorgeous antique picture for her collection of "ovals", a couple of vintage hats and I found just a handful of items....a sweet little Rand McNally book, a children's chalkboard/slate for a "project" and an old ledger book! Then we made the mistake of going to the antique mall at the shopping mall. Not good. I think we bought two things, both souvenir ash trays. We headed home, stopping at the only restaurant for miles off of I-64- Denny's. Rolled in just before dark. Super fun day! NOTE: More pictures will be added later or Tues or Wed when we switch over to Insight! I can't fight the dial up anymore!